Were you lucky enough to meet Flam and Rum yesterday? Sadly I was unable to attend because my internet decided it wasn’t going to work. I hope you all had a good time meeting them and that you grabbed some weevily selfies! If you were unable to meet them or want to see them again, I’ve got some excellent news for you! They will be visiting the Binscape today at 11:00 and 17:00 at Rum’s Airport and Flum’s Fountain! Meet Rum And Flam In The Binscape! Bin-tastic news, two brand-new celebrities will be popping into the Bin today to meet up with you! These celebrities are no other than Rum and Flam! They will be at The Hunt for Weevil X mission on party island today at 11:00 and 17:00 (UK time). The only thing is, which one is party island? Well.. you’ll have to find out for yourself! Did you know? Rum and Flam’s favourite hobby is flying! Rum owns the newly-designed Rum’s Airport and Flam enjoys flying her mini plane, which you can see at Mulch Island! 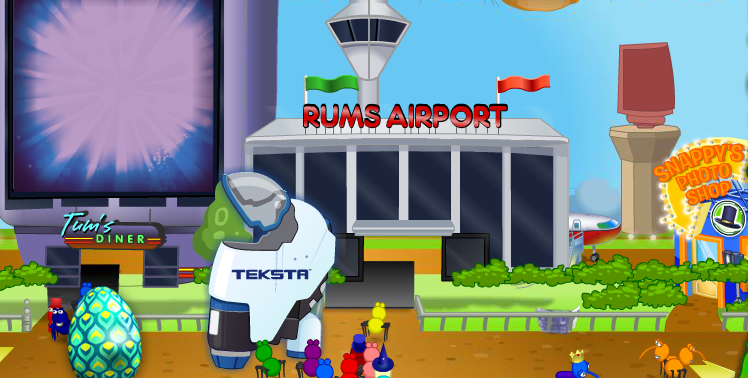 When the amazing Teksta Space Jump released at Rum’s Airport their were some mistakes left behind at Rum’s Airport! Please comment yours thoughts about this error. Do you think Bin Weevils will fix this or what? Not many of you go to Mulch Island, so not many of you’ll know about the fabulous game Tink’s Blocks! To get to Mulch Island, you’ll have to go to Rum’s Cove and enter Rum’s Airport. Once you’ve entered Rum’s Airport, you’ll have to click check in, buy a ticket then you’ll be on a plain. When you plain ride finishes, you’ll need to click the icon that says click to exit. Next, you need to click a quite weird shaped building, which says Tink’s Blocks. Once you enter, you’ll need to click groups of two or more which are the same colours, like I’ve squared below. But if you look at the next picture below, you can see I’ve done two things wrong! I’ve only got one red and blue, so that’s no good, and I can never get the two yellows together! Please let us know if this guide was helpful, by commenting below! We plan on doing many more guides soon.